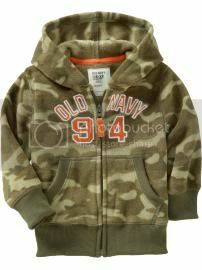 Save up to 50% off on Outerwear from Old Navy!!! This sale is good through 11/13. Old Navy Micro Performance Fleece Logo Hoodies Regular Price $19.94 are On Sale for only $10 and you can earn 1.2% cash back if you make your purchase through zuuzs.com. If you are not a member of zuuzs.com, you are missing out on a lot of cash back to be earned! You can earn 40% Cash Back from purchases the friends you refer make and then you can also earn 25% Cash Back on purchases from the referrals that your friends make! What can make this deal even better than that??? Right now there is a "Get Fired Up For the Holidays Contest" where you can win a Kindle Fire! You can be entered for this contest just by signing up under a participating blogger's personal URL (which I have linked to zuuz.com throughout my post) from November 1st through the 15th. Only 6 days left so hurry and join for your chance to win!!! If you are a blogger and would like to participate in this, zuuz is also doing a giveaway for bloggers where you can win a Kindle Fire or $100 cash!!! If you would like to be a Preferred Partner with zuuz, you can SIGN UP HERE (not a personal link, links straight to the blogger program). There are more additions coming to the blogger program also, so come on and join and be a part of these exciting changes!!!! Hi, I'd like to invite you to post your giveaways on our giveaway directory: Giveaway Scout (http://www.giveawayscout.com). Please submit your blog here: http://www.giveawayscout.com/join/ \'a0Once you receive our confirmation email you can post your giveaways on our site. Thanks. Awesome, thanks for this information! here is very beneficial link for online discounts.